From this SlOkam upto 46th SlOkam “bhavantham“, ALavandhAr, enjoys emperumAn‘s togetherness with beautiful limbs, ornaments, weapons, divine consorts, divine servitors, wealth etc., and asks when will he engage in service to emperumAn which resulted out of that blissful experience. With this ALavandhAr mercifully explains his goal. 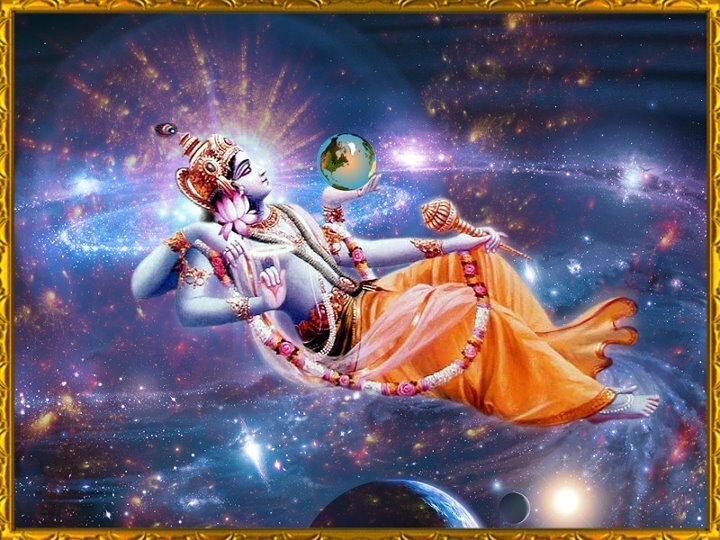 The attainable goal is defined as in Siva [linga] purANam “vaikuNtE thu parE lOkE SriyA sArdham jagathpathi: | AsthE vishNurachithyAthmA bhakthair bhAgavathais saha||” (The inconceivable lord of the universe, vishNu, mercifully resides along with SrI mahAlakshmi, in the supreme abode, SrI vaikuNtam, along with bhkathas (devotees) and bhAgavthas (his followers). virAjamAna – When emperumAn asks ALavandhAr “would you be satisfied if I place my divine foot on your head?”, ALavandhAr says “that is not sufficient” and starts enjoying emperumAn’s beauty. virAjamAna – Beauty due to being contrast to the divine [dark] complexion of emperumAn. ujjvala – The radiance acquired due to his svarUpam (true nature) as said in bruhadhAraNyaka upanishath 4.3.6 “mAhArajanam vAsa:” (The garment of paramAthmA is pIthAmbaram). The [natural] beauty where it appears like the waist have blossomed into the yellow garment as said in thiruvAimozhi 3.7.4 “udaiyArndha Adai” (divine garment which perfectly fits with the waist). pItha vAsasam – As said in nAchchiyAr thirumozhi 14.8 “pIdhagavAdai udaiyAn” (one who wears yellow garment), it is not only beautiful, it also reveals his aiSvaryam (control/wealth). smithAthasI – Like a fresh kAyAmpU (purple coloured flower) which is just blossomed. A seen in mahAbhAratham SAnthi parvam 46.118 “athasIpushpa sankASam …” (bhIshma says – One who worships gOvindha who resembles purple coloured flower …, will not have any fear), perumAL thirumozhi 1.2 “kAyAmpU malarppiRangal anna mAlai” (Sriman nArAyaNa who resembles garland strung with purple coloured flowers), emperumAn‘s divine feet which mesmerizes great personalities. nimagna nAbhim – As said in “Avartha iva gangAyA:” (The divine navel which looks like a twirl in the river gangA), having a divine navel which appears like a twirl in the flood of his beauty. It is said in periyAzhwAr thirumozhi 1.3.8 “nandhan madhalaikku nanRum azhagiya undhi” (the very beautiful navel of krishNa, the humble son of nandhagOpAla). thanumadhyam – It is said in thiruvAimozhi 5.5.8 “siRRidaiyum vadivum” (the slender waist and the divine form), thiruvAimozhi 8.5.3 “thudisEr idaiyum” (very slender waist). unnatham – emperumAn being present as sarvAdhika (greater than all) due to this divine form, garments and beauty. This entry was posted in Other, sthOthra rathnam on January 14, 2017 by Sarathy Thothathri.